The lawsuit, filed in Illinois, listed the company and Uber's chief executive, Travis Kalanick, as defendants and included counts for improper classification under the Fair Labor Standards Act, failure to compensate for off-the-clock work, and lost and stolen gratuities. Uber and its drivers in California and Massachusetts agreed on a settlement that would allow the drivers to solicit tips from riders while staying independent contractors and free of federal and state wage and hour requirements (O'Connor v. Uber Techs. Inc., N.D. Cal., 13-cv-03826, settlement agreement 4/21/16). The settlement, which needs court approval, is to cover 240,000 drivers in California and 145,000 drivers in Massachusetts. A trial was scheduled to start June 20 in a federal court. The settlement agreement, which still requires court approval, would require Uber to pay as much as $100 million to drivers in California and Massachusetts and permit the drivers to solicit tips from riders. But the agreement lacks the kind of labor law clarity that has angered critics of gig economy models, permitting Uber to continue to classify its drivers as contract workers. 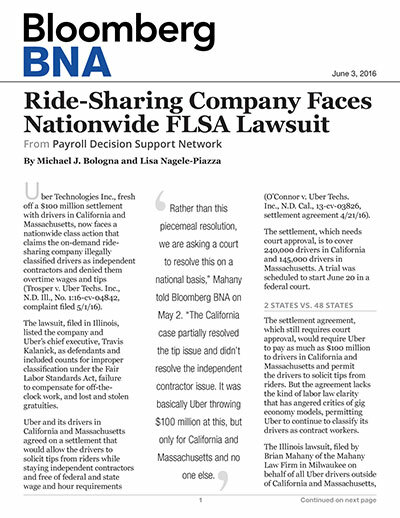 The Illinois lawsuit, filed by Brian Mahany of the Mahany Law Firm in Milwaukee on behalf of all Uber drivers outside of California and Massachusetts, said the April 21 settlement offered no relief to drivers in 48 states and the essential pay equity and employee protection issues at the heart of the dispute. Mahany insisted his action would penetrate those questions on behalf of his clients and offer some clarity to other on-demand economy workers toiling on behalf of companies such as Lyft Inc., GrubHub Holdings Inc. and Upwork Global Inc.
Uber cannot hide behind the independent contractor moniker because it actively “micromanages” all aspects of its drivers' professional lives in ways that should designate it as a traditional employer, Mahany said. The company “tells the drivers what price to use, pays the driver directly from fares collected from the customer, makes direct deposits in the drivers’ bank accounts, provides the drivers with a pay statement, monitors the drivers’ number of trips and hours on line and tracks their acceptance rate and driver rating,” the lawsuit said. In a statement May 2, Uber only stressed the importance of the independent contractor designation. In two other potential class actions, Uber drivers were told to arbitrate claims on worker classification. A Maryland driver could not proceed in court with a proposed class action because she signed an enforceable agreement to individually arbitrate claims against Uber and its subsidiary Rasier LLC. (Varon v. Uber Techs. Inc., 2016 BL 140349, D. Md., No. 1:15-cv-03650, 5/3/16). In Ohio, a federal court ruled that a former Uber driver must arbitrate state-law wage and hour claims against the company (Bruster v. Uber Techs. Inc., 2016 BL 163856, N.D. Ohio, No. 1:15-cv-02653, 5/23/16). The court said the driver, who claimed he was misclassified as an independent contractor, agreed to designate an arbitrator to determine the enforceability of the provisions. The ride-sharing company Lyft, in a separate case, increased its proposed payout to 163,000 California drivers to $27 million in their lawsuit to be treated as employees rather than as contractors (Cotter v. Lyft Inc., N.D. Cal., 13-cv-04065, proposed settlement filed 5/11/16). The revised settlement comes after a San Francisco federal judge rejected an earlier $12.5 million offer, saying it would have shortchanged drivers. If approved by the court, the settlement would let the ride-share company continue to classify drivers as independent contractors.